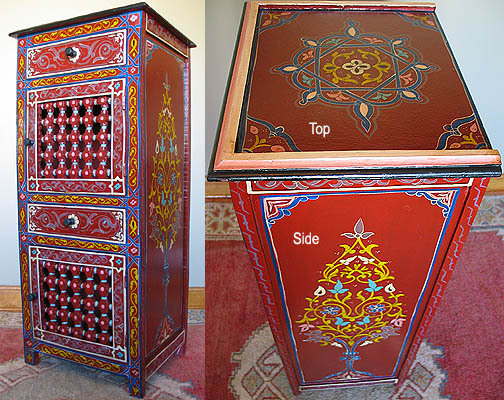 Beautifully handcrafted from wood and precisely hand painted with real Moroccan colors and Moorish designs. The paint is oil based, protects the piece and makes it easy to clean or dust off when needed. It is decorated on the front, the top and on both sides. It has 2 compartments for storage with doors that open and 2 drawers. The two doors are nicely decorated with mousharabi, a screen made of small wooden pieces that are carved and mounted together to get this beautiful screen pattern. This is an excellent décor item. It can be displayed in different areas of the house such as entry console, in living rooms, or in dinning rooms etc... It even makes a nice cabinet for bathrooms, hallways. Yes if it wasn’t the perfect décor item, it wouldn’t be giving you the flexibility to use it all over your home! Plus, what you see is what you get! 40"H X 17"W x 13"Depth. Shipping will be adjusted based on your zip code that the package will be shipped to.